It’s not “Kung Fu Panda” or “Monsters Inc”, but “Turbo” has enough charm and colorful characters to entertain kids and adults alike. The unusual hero here is a snail called Theo who dreams of competing in the Indianapolis 500. Of course that’s no easy task for a snail, that is until it gains superpowers during a trip through a car’s engine (don’t ask). Yes the plot couldn’t be more predictable, but it gave me a lot to cheer for: a likable character, some stunning visuals and a clever execution to match them. The voice work is top-notch, and Ryan Reynolds as Theo (who later on becomes Turbo) is supported by a colorful cast, including Paul Giamatti, Michael Pena, Samuel L. Jackson (that guy is everywhere), Luis Guzman and Bill Hader, who brings a French Canadian accent to villain race-car driver Guy Gagné (lol), who calls our hero “my leetle competition. 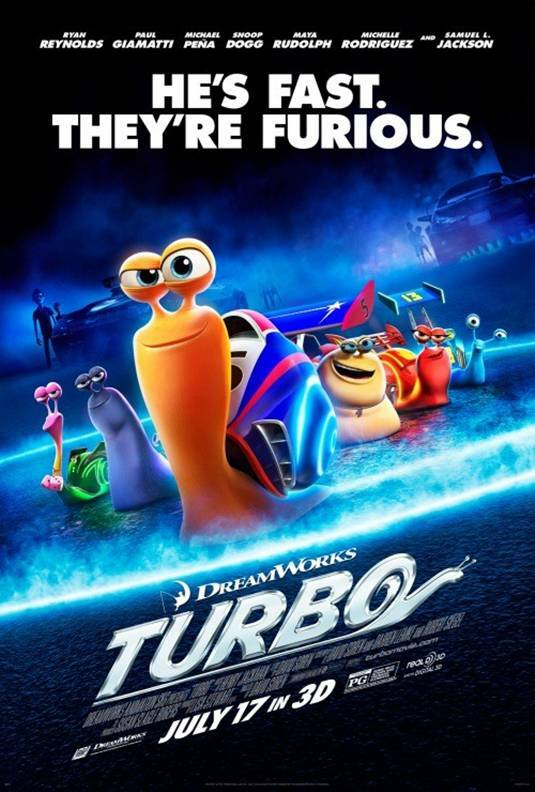 “Turbo” elicited hearty laughs from many audience members, especially kids at the screening I attended. I found myself smiling and chuckling more than laughing, but I have no complaint about a film that offers imagination and sheer nonsense in equal measure. Pixar may be stronger on story development, but Dreamworks Animation films have their own sense of humor, and I hope they never abandon it.